I was very privileged to attend this marvellous event last month. Having never made a full size quilt myself I knew this would be visit where I would be challenged and inspired. 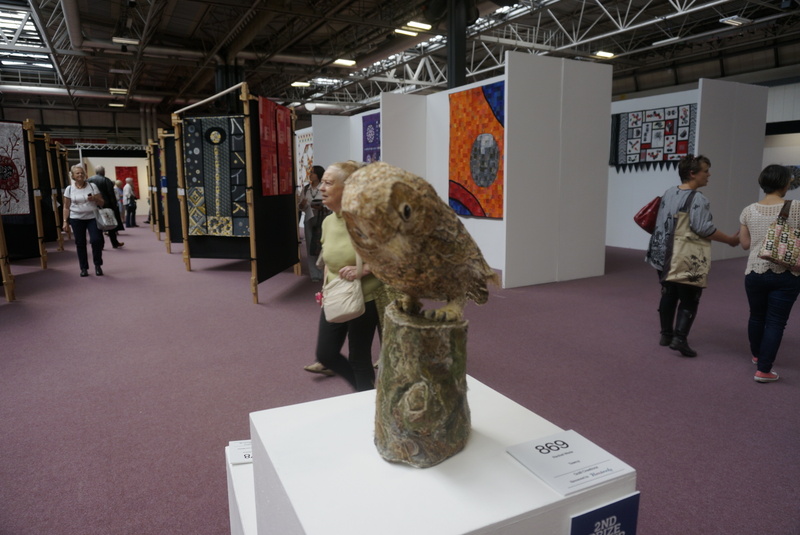 Walking into the huge halls filled with incredible quilts was quite overwhelming. Where to start I wondered? Then there were rows and rows of vendors selling every conceivable item associated with sewing and quilting. I have never seen so much fabric in my life. I think I must have walked around the displays several times and took lots of photos of these splendid quilts of many sizes and themes. Not every one was to my taste but if I showed you all my favourites it would make a huge post on this blog, so I will try and be controlled and just show you some of those that made a big impression on me. Everybody was talking about the quilt which very touching as I seem to remember that it depicted the maker’s dear grandmother. 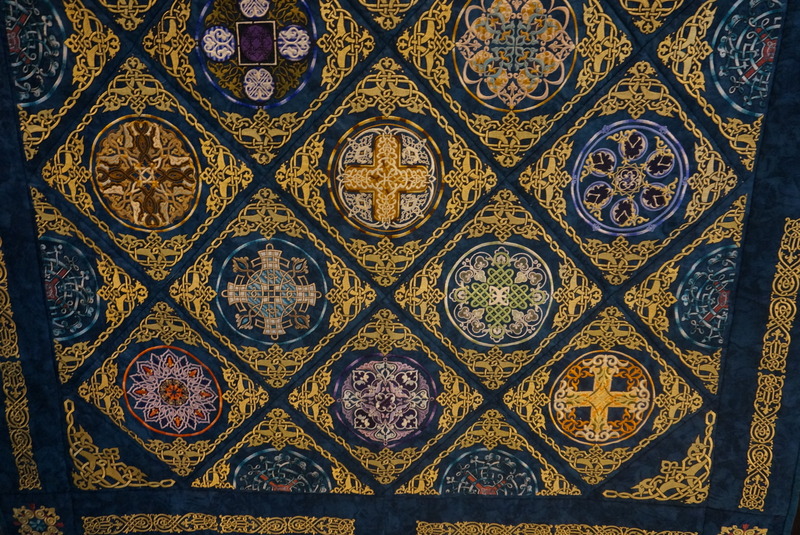 The Celtic work done in embroidery drew me to this quilt which must have taken hours to create. Not a colour scheme I would have chosen but very striking needless to say. There were not an abundance of quilts featuring machine embroidery so I was keen seek out those which did. 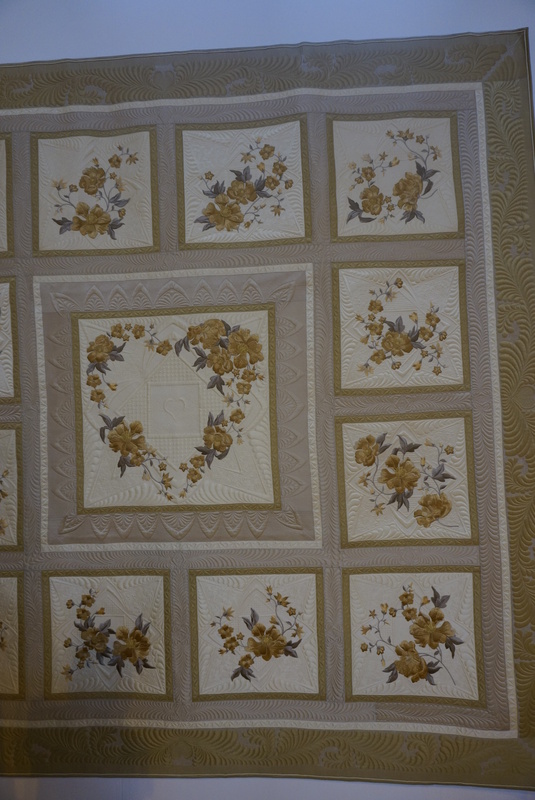 This was a beautiful quilt that had the perfect combination of colours! I was pleased to see the stunning embroidery designs created by Jenny Haskins on this lovely quilt which is more my colour scheme. Gorgeous and I was fascinated how the flowers stood out! 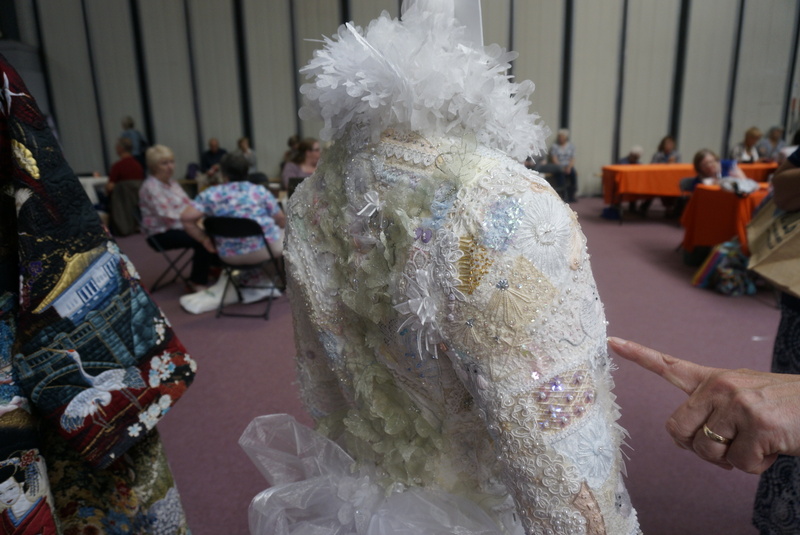 It was interesting to hear a passing comment “too much heavy embroidery, don’t like that at all!” I refrained from commenting realising that everybody has different tastes which this exhibition highlighted. 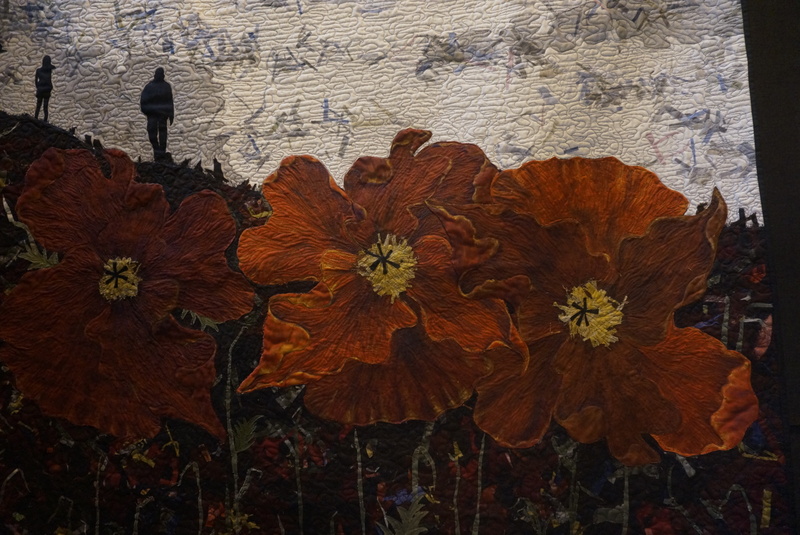 This was the most moving quilt in the exhibition depicting the scenes in Europe during the First World War! The petals of the poppies were so carefully produced so they stood out, curling in all their glory. 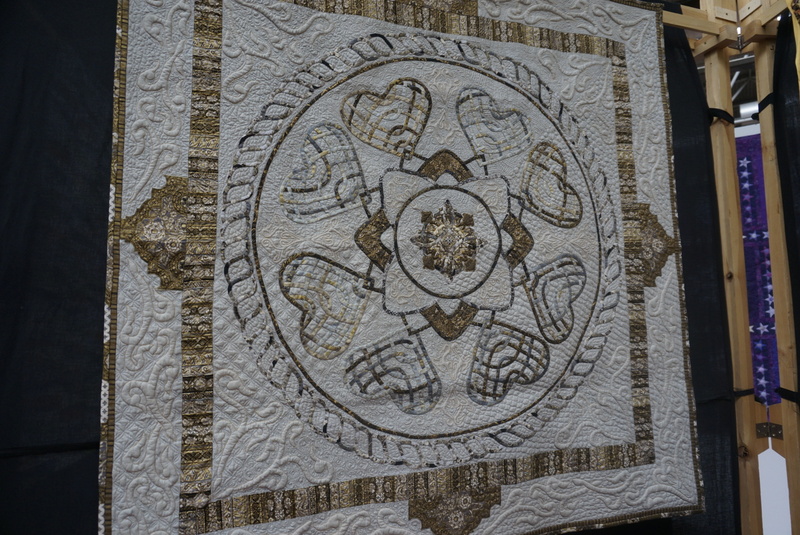 I loved the way this quilt captured the beauty of Celtic work in a different manner. Not a quilt but absolutely fascinating and near to the area where I sat and made friends over coffee. The atmosphere was so friendly and I loved that you just chatted with everybody. Finding a seat was a challenge though! 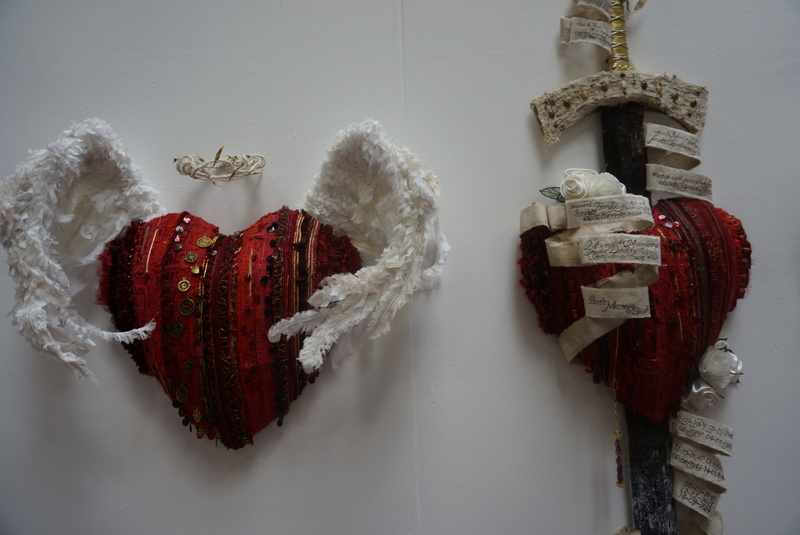 Amazing red hearts with so much detail, I wish the photo showed them better. 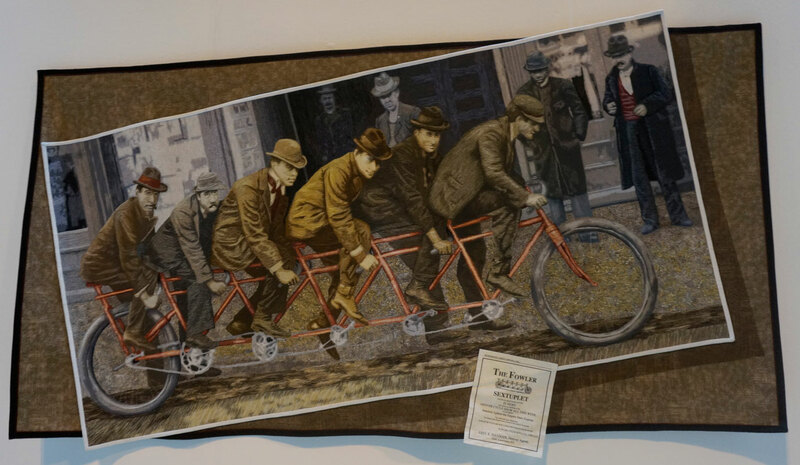 I was drawn time and time again to this quilt probably because of the heirloom garments! You had to look twice to see if this was really a quilt! Fantastic and eye catching. Should have been the overall winner of the show. 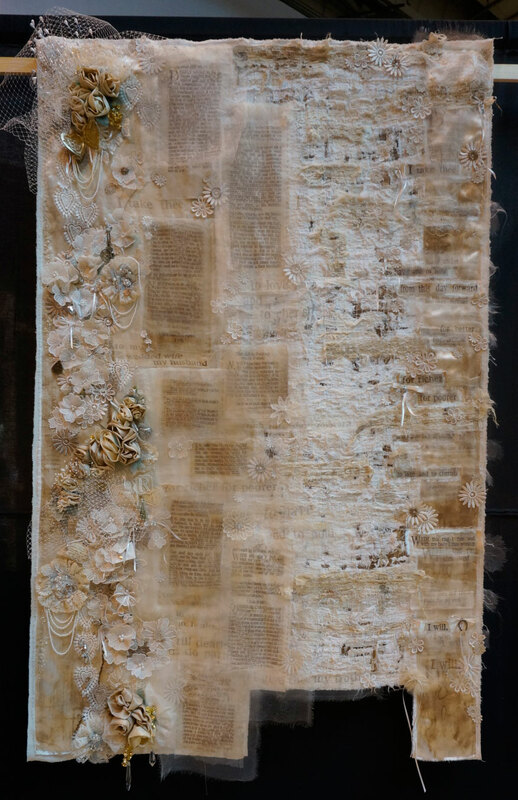 This lovely quilt reminds me that it is time to close and draw my experiences to a conclusion. Was it worth attending? I was very much inspired and spent too much in the vendors area but it needed more than a day to see everything. During a chat over coffee with an Irish lady told me she comes every year and stays for the duration of the event meeting old friends and making new ones like me. We discussed Irish dancing and the costumes so I was in my element. Perhaps that is the way to do the Festival to avoid the aching feet and the sense that you missed out on so much. I close with my favourite quilt and those who know my work will not need me to explain why. I cannot find the words to describe this work of art which captures the beauty of embellishment which I am always keen to encourage! 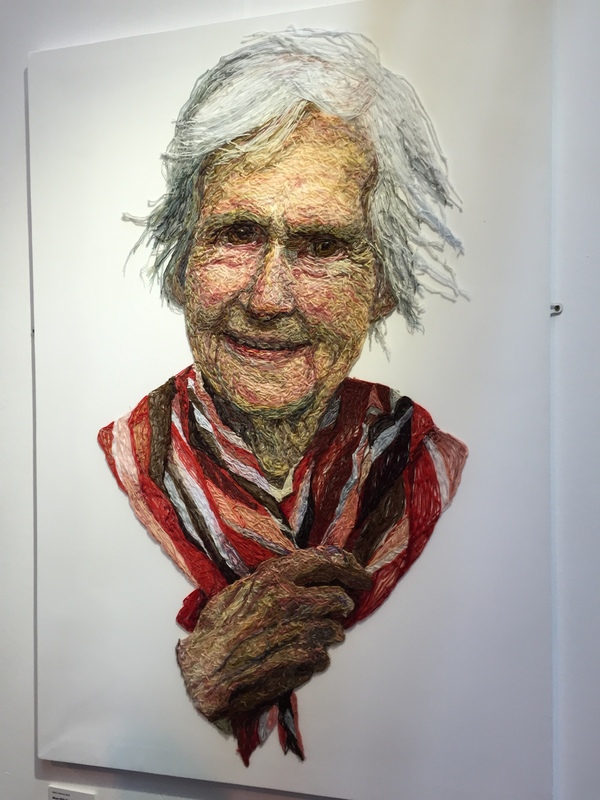 This entry was posted in Inspirational and tagged Exhibitions, Quilting. Bookmark the permalink. I didn’t go this year, so thank you , Hazel , for going on my behalf. 🙂 It is always an inspiration… unless you feel very inadequate after seeing all the marvellous work, as I sometimes do. I, too, was enchanted by your favorite quilt at this show. 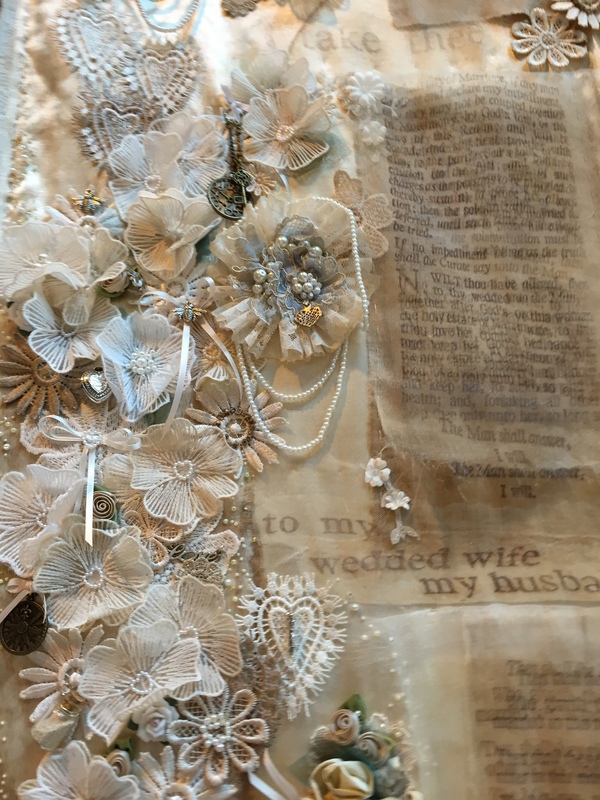 It rises to the level of needle art—partly an heirloom design—–richly adorned with pearls——-yet maintaining a using items-at-hand quality. 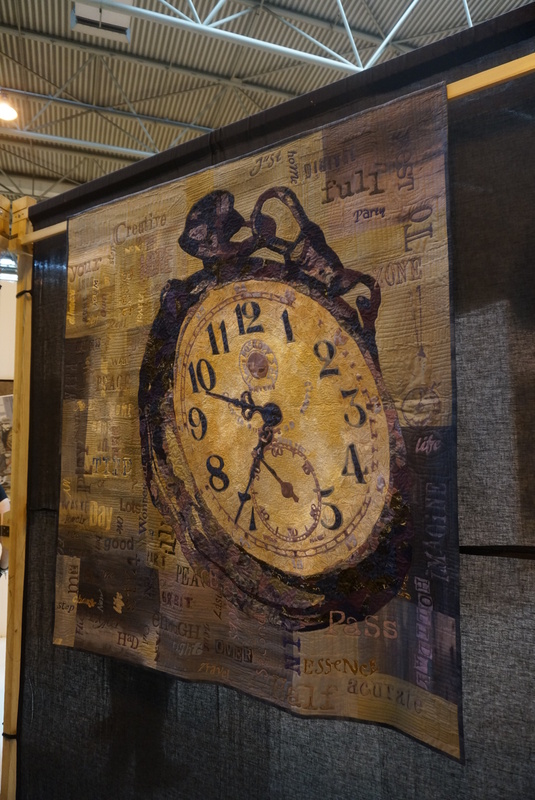 At the annual Maryland State Fair, there is a juried exhibit of the best quilters in the state. 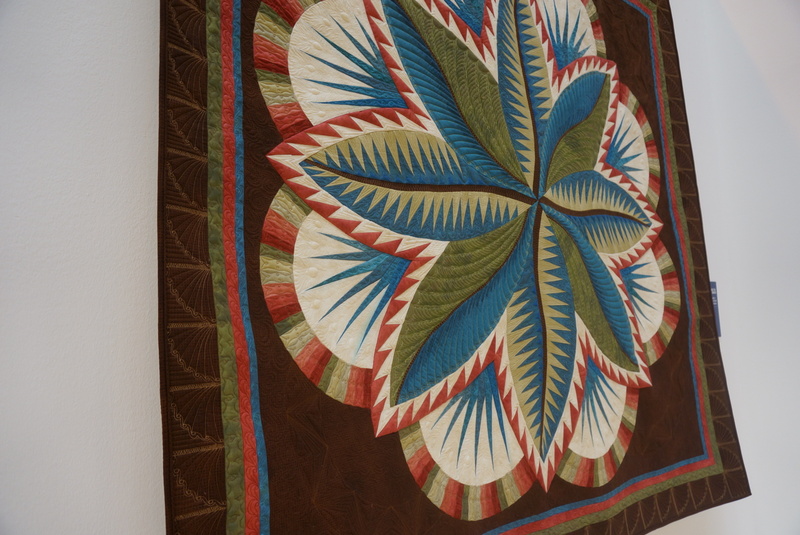 These quilts are deemed so valuable that they are suspended @ 15 feet above floor level, and guards are everywhere. Many of the Maryland quilts are in-part or wholly machine made, and I view this as a trend in quilt making. I was so impressed by my visit to the state fair that I have begun a notebook outlining the design for a picture quilt, Baltimore By Night. How fascinating. It really opened a whole new world for me. Well, be still my heart. Your favorite quilt of the show took my breath away. Indeed for the same reasons I am sure I love it. 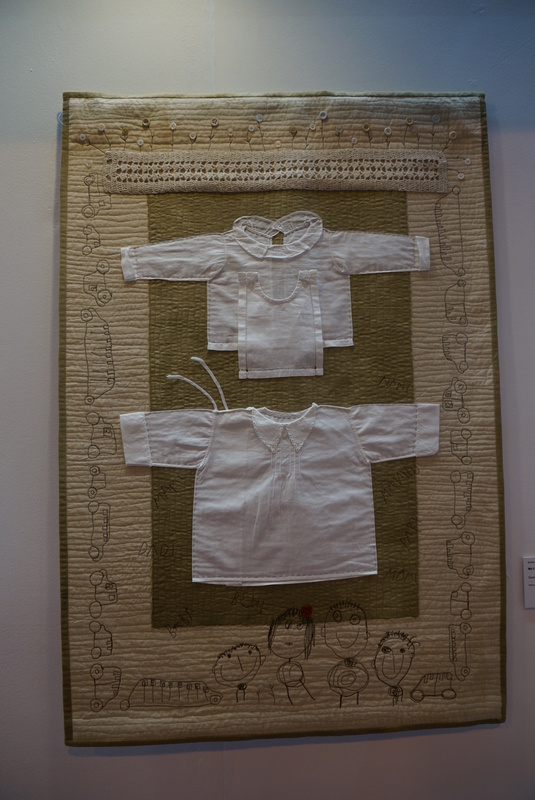 Also loved the quit with the vintage baby garments. That one really drew me in also. I love vintage garments, aprons, sheets pillowcases etc. What a lovely time you must have had and joy visiting with the Irish lady and Irish dancing, which I love also. And……….how about those wonderful Irish tenors? Oh my oh my. You really do need to enter a quilt with your amazing embroidery on it. Almond Paisley would be just so stunning. Now there is an idea. Oh for the time to complete every project that I want to make!